The Greatest Cup Competition? Try France! It is almost sacrilege in England to suggest that the FA Cup is anything but the best of all the worlds domestic cup competitions. But to take such a blinkered view is to ignore the pleasures of cup football beyond the channel. I would not head for the Spanish or Italian competitions, professional organised, and planned to please the professional cups, but the low countries, Germany and France all have competitions worthy of note. The French in particular is noted for giving the underdog a chance. As in England, France plays Eight rounds of competition before the top division is included (and as in England, there are then 64 teams contesting, and the new year is upon us), although their second division teams have to start some two rounds earlier. Down the divisions, the various leagues all come in at different points, but amazingly  considering the number of rounds is the same as in England  the total number of clubs in ten times as many. The FA Cup has space for around 600 teams, but the Coupe de France has over six thousand. Of course you lose some things with this  with over 6000 teams, there is no minimum ground standards for the cup  if the ground is not suitable for the crowd expected, then the match will simply be moved to a larger stadium. The other thing the French do without is replays  but this works in a French way. The French league is just about the lowest scoring in Europe, with all but the best away teams going away and attempting just to hold onto the point for 0-0. The single match nature of the French Cup frees away teams. If there was a replay, then they would be under pressure to defend and get it, but as there is no replay they can attack even away from home. There is one other unique selling point to the French cup, and this is the seven Outre Mer teams. If the remains of the British Empire are these days ignored, almost an embarrassment except when we fight wars to defend them  and these remains are encouraged to enter international competition in their own right, the French keep their remaining possessions close at hand, and politically, some are treated the same as if they were part of mainland France. Having frequently voted to keep their French connections, and against independence or a union with the Comoros Islands, the small territory of Mayotte is to become a French department in 2011, (despite the fact this would mean an increase in taxation). It became the seventh of the overseas territories to have French cup status in 2002, following Reunion, Martinique, Guadelopue, Guyana, French Polynesia (Tahiti) and New Caledonia. Mayotte is situated in the Indian Ocean, north of Madagascar and not far from to Comoros Islands  it consists of two main islands, and a number of smaller (many uninhabited) ones. Oddly, because the capital used to be on the smaller island of the pair, the international airport is not on the main island. Each year, a local cup competition will decide the territories entry into the main Coupe de France (each overseas territory gets one entry only, entering at Round 7 with the second division teams). This year the team is Kaweni, from just outside the capital. To get to play in Petit Quevilly, (a southern suburb of Rouen), they had to get to the airport by boat and taxi, then fly first to Reunion, and then from there to Paris  still a two hour coach trip to their destination. On arrival, they find that the Amable et Micheline Lozai is a typical football ground, with no track and the sides square to the pitch. The names refer to the club president and his wife during a successful era for the club. On one side there is covered terracing along the whole length, whereas the main stand takes up about the third of the other side with other buildings to the sides, (furthest away from the entrance) is the dressing rooms, while nearer is a room used for VIP and guests. General refreshments are served from behind the goal by the entrance on a flat area. There is no access behind the far end goal for spectators. The last picture seems to be a mixture of supporters and the visiting ‘WAGS’. Certainly some of the girls had come with the team from Mayottte, and there were some supporters that had made the journey. On the other hand, when I questioned the only people wearing Kaweni replica shirts, they turned out to be students from Lyon. The Quevilly team have a cup pedigree of their own, they reached the final in 1927, when they lost 3-0 to Olympique Marseille. They were the top amateur club in France in the mid-fifties, winning the amateur championship twice in successive years, but after that they must have gone into some decline – as by the end of the seventies, the club was wallowing in the fourth division of the district league. This is about as low as a club can get in France, but things have picked up – over the next 22 years the club won promotion 9 times (with one relegation to compensate). This brings them back to the CFA, the highest level of amateur football in France. (The amateur title, won by Quevilly in the fifties, is now given to the winner of play-offs between the four regional CFA winners). When Quevilly were at the lowest ebb, neighbours FC Rouen were at the top level of French football – (they were relegated from the first division in 1985). Last season they met in the CFA, with FC Rouen winning the title and returning to the National level, while Quevilly finished a credible third. While I believe I was the only English groundhopper at the match, I met up with Stephan Schlei, a German groundhopper and hitchhiker. Stephan informs all (he has it printed on a card) that he is a World Record hitchhiker, recongnised by the Guinness Book of Records. I do not quite know what this means, but I do know that Stephan travels the length and breadth of Europe through hitchhiking and sleeping rough. Last season, I had also met Stephan when watching “outre mer” teams in the French Cup, we both watched Colmar v AS Tefana (Polynesia) one day, and St. Louis Neuweg v Jeanne d’Arc (Reunion) the next, both matches won by the visiting team. On that occasion, Stephan refused to travel with me between games, preferring to make his own way – but this time he was desperate to persuade me to drive to Pontivy where the Guyanese club CSC Cayenne were to play. Sadly, I could not help, as I was in my own car, and needed to return to Calais the following evening. Stephan even offered to pay my entire expenses for the trip – although I do not think he realised I would be almost doubling the weekend milage (which cost me £100 in petrol anyway), and the road tolls in France are high – anywhere between 40 and 80 extra – and another £50 or more if I failed to make the last Eurotunnel shuttle trip before midnight. In the end, I gave Stephan a lift to the nearest motorway services (30 miles return) for which he just paid the motorway toll of 2.80 (and he was looking for a way to avoid that), and kept to my plan of watching FC Rouen. But what, you may ask, of the actual game between US Quevilly and ASC Kaweni. The answer was it was a predictable procession. In their eight previous attempts on the French cup, teams from Mayotte had lost eight times, scoing just three, but conceding 29. Kaweni themselves had never previously represented the islands at this stage. It took 27 minutes for the resolute defence to be broken down, but even in this time, it was always a question of when, and how many goals. The score was quickly built up to 3-0 at half time, with another two minutes after the break. Two more were added later, and the game finished 6-0. Still you have to admire the Africans for making the journey from summer in the Indian Ocean to a cold and wet city in Northern France, to face what a defeat that was surely inevitable. Still, the first representative from Reunion lost 14-0 – and they are now the most successful of the “outre mer” teams, this season, Excelsior, from Reunion were the only won to get a win this season with a 1-0 win over Quimper. Excelsior will visit Angers in December. For me, it was on the FC Rouen…. Who wants to be Top Klasse in the Netherlands? It was the summer of 2008 that FIFA added a section on promotion and relegation into their statutes. Even at the time, FIFA were quick to point out that the new rules would not be applied retrospectively. Hence although not in compliance with the regulations, no action will be taken against countries such as the USA, Singapore and Australia which use a franchise system and do not have direct promotion to their top divisions. The idea that FIFA was trying to nip in the bud was that of new European super leagues that could be created without any promotion or relegation. At the same time, FIFA directed that a club could not uproot and move, in the way that Wimbledon did before becoming MK Dons, or Clydebank becoming Airdrie United and numerous other cases in Eastern Europe. (The test of this still seems to be with local FA’s. Arles to Avignon (39km) having been acceptable this season). To be honest, none of this makes much difference to the boys at the KNVB (Netherlands Football Association), who were already looking at ways to bridge the gap between the closed shop two divisions of their professional league, and the well organised double pyramid that in the amateur game. The Netherlands are unique in Europe in offering parallel, (generally equal) systems for non-League football, played on Saturdays and Sundays. Across Europe, the traditional day for playing football has a religious divide, with the Catholics of Italy and Spain being played on Sunday, while Protestants tend to play on Saturdays. The Netherlands however has a full structure of amateur football on both dates. The top level for this is currently the Hoofdklasse, which is divided into three regional groups, hence giving a total of six divisions, (three Saturday, three Sunday). Below the top level, the game is organised in six regions, unexcitingly called North, East, West 1, West 2, South 1 and South 2. Each of the six regions runs football from first class (one Saturday, one Sunday per region) down, and the regional cup competition (four teams from each regional cup on season qualify for the national cup the following year). Regional and National cup competitions, and the final of the end of season amateur play offs are the only times that Saturday and Sunday teams meet  and the rule is always that such matches are played on Saturdays. A Saturday team can always refuse to play on a Sunday. As I have said, the KNVB have been looking for a way to bridge the gap between this system, and the two division professional league. Currently, teams move into the professional league by applying for a place, and proving that they have suitable facilities and finances for the higher level. There is no method for moving in the other direction, and the KNVB will not contemplate forcing a team to drop out of the professional league until there is a direct promotion available in the other direction. This is despite the fact that be allowing several new teams to join the league in recent years (Top Oss, AGOVV, Omniworld), while teams have not be dropping out, and mergers are no longer in vogue  which means the lower division now has 20 teams, the KNVB would prefer both divisions to be 18. Until the start of the current century, there seemed to have been significant losses from the professional leagues  teams dropping out for financial reasons, while others merged  recently however, there have been no drop outs, and fans have started to transfer against mergers. Efforts last season merge Roda JC and Fortuna Sittard, both in financial trouble, failed due to supporters’ campaigns to keep their own clubs. So, from next season, the KNVB plan is to introduce a new Top Klasse, above the Hoofdklasse. The Top Klasse will be a National Amateur League. Although of course it will be repeated for both Saturday and Sunday football. The end of season championship matches are therefore simplified. At the moment there are play-offs between the three Hoofdklasse champions to find the Saturday and Sunday Amatuer champions, but these will be unnecessary, leaving only the grand final to select the overall champion. Promotion to the professional leagues will be limited to a single team, with only the two Top Klasse champions being eligible. If neither title holder wishes to apply for promotion, then no team will be relegated, but as the professional league currently has two more teams than it should, it has been decided that the bottom two sides from this seasons Professional League will be relegated into the new league. This has led to protests from clubs in the league, with the current bottom club, Emmen, saying that a relegation of this form would practically be the same as sending them into liquidation. Faced with this sort of bad publicity, the KNVB are now considering parachute payments, similar to those made to clubs relegated from the Football League to the Conference to help these clubs to keep on running. I am told the most likely result of this decision is that the clubs near the bottom of the league will go on a spending spree in the transfer window in an attempt to sign players to stave off the threat. This, of course will increase the debts, and I would be surprised if the crowds are increased by the anti-relegation fight. Nine of the 20 teams get less than 3000 per match, only 3 get over 5000. Heerjansdam is a typical small town in the Netherlands, which means it is neat, tidy, very friendly to the cyclist, it is low rise and low key, with a bland shopping centre  and of course, it has a football ground somewhere on the outskirts. This has a large stand on one side of the pitch, while the rest of the ground is surrounded by a level pathway. Like most amateur teams in the Netherlands, it stands as a true community club, apart from the first team, which is run as a semi-professional team and will recruit players in the same way as a team anywhere else, the club will run as many teams as it feels are necessary to meet the community’s desire to play football. For youth football, in every age group, this may mean running three, four or more teams. Quite simply, if you are a youngster in Heerjansdam and you want to play football, then you will play and be coached by this one club. It also means that if you run a business in the town, then either you, or some of your employees are sure to have an involvement in the club either directly, or because their children are involved. Hence most small businesses put a small amount of money into club sponsorship. Sportpark de Molenwei, Heerjansdam. The clubhouse backs onto the stand, whereas there are further pitches behind the trees. The away team for my game is ASWH  a very local derby (they share a motorway intersection). Heerjansdam are in the 1st Klasse, Zuid 1 (after relegation last season), while ASWH are if Hoofdklasse A. The match is in the regional cup, and hence has the unwieldy title of Districktbeker Zuid 1, Round 1. Apart from local cup glory, the four semi-finalists from this competition will play in next season’s national cup. Although both sides for this match are from the Saturday leagues, the cup bridges date divide, and also has Sunday clubs in competition. I am told that Heerjansdam had beaten their neighbours last season despite ending the season as relegated. I had been to ASWH in 2005, to see them become the Amateur champion of the Netherlands. [incidentally, the name stands for Altijd Sterker Wordend Hendrik-Ido-Ambacht. The last part of this is a placename whereas the first three words means something like “Always Becoming Stronger”. Such slogans are common in Netherlands football club names, and are perhaps the reason why clubs now prefer to be known only by initials]. Both clubs have made good starts to the season, but it took a while for this to notice on the field, or for either team to create a chance worthy of note. What was evident was a lot of progress being made on the wings, being ended by poor crossing. De Jager should have put the visitors ahead around 30 minutes in, missing a clear chance when the ball successfully made it to the far post, and then Heerjansdam created three good chances as the half came to a close. The first was blocked, but resulted in a corner, which for once was delivered into the danger area for centre half Gert-Jan Stout to bundle over the line. Jeroen Wolf should then have added a second in injury time, but he hesitated and allowed visiting keeper Jacob van der Belt to close down the chance. The final (saved) penalty. Note the high number of advertising hoardings, a common feature of grounds in the Netherlands and Belgium. ASWH came out for the second half with all guns blazing, and it was no surprise when substitute Henk Roeland brought the scores level; but in an already physical game, ASWH almost brought about their own downfall. Verluis was booked for a challenge in the 66th minute, and had to be restrained by his goalkeeper. Two minutes later with the ball out of play he was in trouble again and was fortunate to only get a second yellow and not a straight red. The game continued to be physical, and the referee ended up showing ten cards, but there were also plenty of chances for both sides in the second half  but a couple of good saves including a tremendous dive by van den Belt in injury time, and a lot of timely blocks kept the scores level. The match then went straight to penalties, but the home side did not come good here, missing the first two, while ASWH hit three in a row. 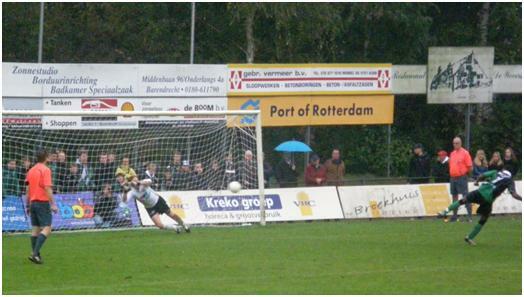 Van den Belt then saved the third to give the visitors a 3-0 penalty shoot out win. You are currently browsing the Football Shaped blog archives for November, 2009.